"At Blois Joan told me to have made a banner around which she would assemble the priests, and to have painted on it the image of Christ crucified. The banner ready, Joan each day-once in the morning and once in the evening-had me convoke all the priests. These, assembled, chanted anthems and hymns in honor of the Blessed Mary. Joan was always with them but would not permit any of the soldiers to be there who had not confessed that day, and she notified all to confess themselves and come to the meeting, seeing that all the priests there held themselves ready to hear all penitents of good will." "The Count of Vendome conducted Joan to the King and led her into the King's chamber. When he saw her he asked Joan her name and she replied: "Gentle Dauphin, I am Joan the Maid, and to you is sent word by me from the King of Heaven that you will be anointed and crowned in Reims and you will be Lieutenant to the King of Heaven who is King of France.' And after other questions put by the King, Joan said to him again. 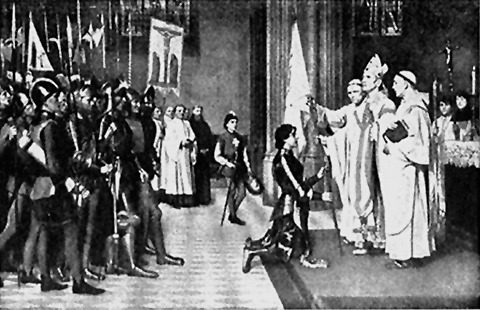 'I tell the, on behalf of Messire, that thou art true heir of France and the King's son, and He has sent me to thee to lead thee to Reims, that thou may receive thy coronation and anointing, if thou will.' That heard, the King told those who were present that Joan had told him certain secrets that none knew or could know, excepting only God; that is why he had great confidence in her. All this I heard from Joan's mouth, for I was not present." "Rise tomorrow very early, earlier even than today, and do the best that you are able. It will be necessary to keep always near me, for tomorrow I shall have much to do, and greater need of you than I have ever had. Tomorrow the blood will flow from my body, above the breast." "In war and in camp, when there was not enough provision, she would never eat stolen food. I firmly believe she was sent from God on account of her good works, and her many virtues. Even on the poor English soldiers she had so much compassion that, when she saw them dying or wounded, she had them confessed. So much did she fear God, that for nothing in the world would she displease Him. When she was wounded in the shoulder by an arrow-which went through from one side to the other-some spoke of "charming" her, promising in this manner to cure her on the spot. She replied that it would be a sin, and that she would rather die than offend God by such enchantments."